Cities Connection Project | KINDERGARTEN. STABIO. From afar, the landscape is dominated by the Monte Gen- eroso range to the north and the Stabio village centre to the south, with its elevated castle. The project maintains the continuity of the territory between these two impor- tant points of reference. The kindergarten is a two story solitary building on a green field. Only paths and walls connect the new mea- sure to create a subtle, far-reaching texture of reference points within the site. The architectural expression of the compact structure can be detected through a few basic elements. 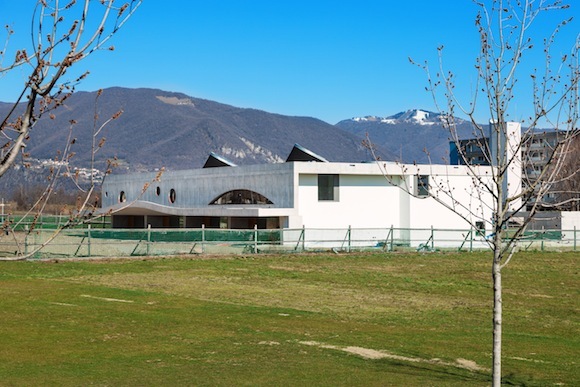 The folded shape of the large concrete roof with its geometric curvature and skylights defines the front façade with the portico and the architectural ex- pression of the building. 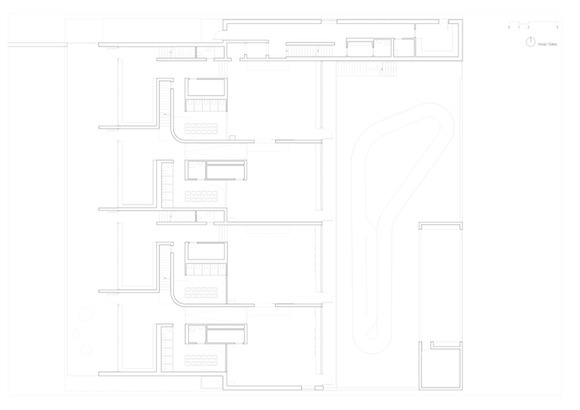 The kindergarten consisting of four departments thrives on the dialogue between the interior rooms and exterior spaces. The typology of each unit creates such relation- ship. The children should experience space and architec- ture in a natural and playful way, and at the same time as part of their education. The theme of setting limits in its different varieties guides children in their search for freedom and their need for intimacy. Extroverted and in- troverted moments alternate in a series defined by the different activities. Horizontal and vertical connections allow the perception of the overall facility from each of its units. As in a small town, spaces of different size and shape, light, material and color determine a rich and ver- satile environment and the specific identity of a site.